Although there is an active social finance sector on Vancouver Island, many people do not use the term “social finance” to describe what they do. Like social enterprise, the terminology of social finance is somewhat familiar, but no one definition is commonly agreed upon or used. Many actors strive to generate social and environmental impact through their investing. But once again, there is no common definition or approach to measuring impact. Shared avenues for learning and development have yet to be established, although interest is growing. The delivery of finance to diverse social ventures (including such local agriculture initiatives as community gardens, fish hatcheries, and new farms). The delivery of private investment through the Capital Investment Network and other forums. Infrastructure development and job creation for housing and renewable energy. 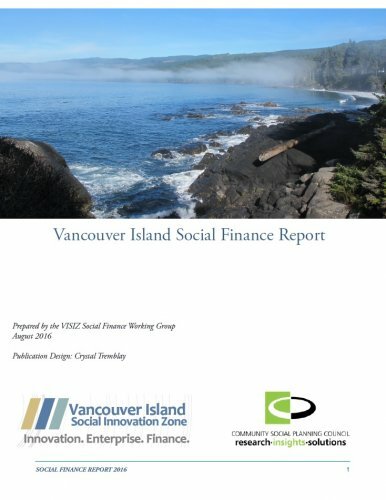 The Vancouver Island Social Innovation Zone (VISIZ) and the Community Social Planning Council of Greater Victoria (CSPC) have been looking into the challenges and opportunities currently facing the social finance sector on Vancouver Island. This is the final report on that research, plus recommendations for action. VISIZ is guided by a number of working groups. One, the Social Finance Working Group, identified the need to better understand social finance on Vancouver Island. To this end, a research project was designed to examine the sector’s capacity. The Working Group worked with a CSPC research team to design a survey and identify sector actors and other key informants to interview. The CSPC carried out these interviews in February and March 2016. Initial results from the interviews were presented at a Social Finance Forum held April 5, 2016. Forum delegates discussed the findings and provided additional information, perspective and input around sector priorities and actions. The results of this research identify some serious barriers to realizing the social finance sector’s full potential. There are gaps in the knowledge and capacity of organizations interested and active in social finance. There needs to be a more centralized location for education resources. In-person workshops are required about social finance in general, and about establishing social finance organizations. Social finance products must be restructured to reduce their perceived risk and make them more viable in the world of mainstream investing. Lastly, legislative and regulatory policies should be amended to help incentivize investment in the social finance sector. Clearly, this will take some time and planning to implement properly.